The grey light slanted in through the thin spaces between decrepit Victorians and glared against my supervising attorney’s dirty windshield as we rolled through one of the most dangerous neighborhoods in West Oakland, California. We knocked on the door that was the last known address of our client. Baby Momma peered at us with one eye just below the safety chain and let us know “he don’t stay here no more, he up at Rene house.” Our client had a hearing next week, but he had gone M.I.A. several days ago, so we were canvassing his neighborhood looking for him. We must have handed out a dozen cards to his family and neighbors before the ‘hood shrank away from us, shrouding our client deeper in its shadows. Long after my poverty law intern days, my grandmother’s Yiddish idiom continued to echo: the soup can’t be hotter than the pot. We have all experienced that niggling, awkward mismatch of energies between attorney and client. Sometimes the case has reached a critical pinnacle and the client is now deploying expert evasive maneuvers. Other times, the client is uber exuberant just when a case has stalled and gone fallow. In either case, the resulting interactions can be exasperating. Luckily, there is an extremely effective model for managing these kinds of situations. 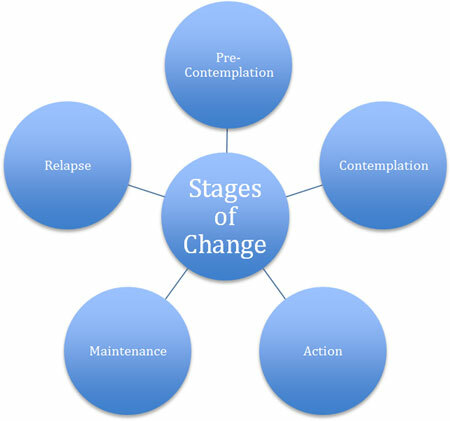 In psychology, it is called the Transtheoretical Model, and it is used by behavioral specialists to manage the processes of a person moving through what are referred to as “The 5 Stages of Change.” As attorneys, we sometimes forget how large a legal issue looms in the minds of our clients and the related stress can produce some interesting behaviors. However, properly assessing your client’s stage of change can help you harmonize your client’s level of engagement with the realities of the case at hand. In the pre-contemplation phase, clients are either not aware of the reality of their situation, or may be in denial about its severity. At this stage, clients tend to err on the side of caution, or inaction, and minimize the positive potential of action. This may be the new referral with whom you endlessly play phone tag. Do not take this avoidance personally. Instead, focus your communication on heightening the client’s awareness. Emphasize the importance of a statute of limitations or other temporal imperative. As a matter of professional responsibility, you may want to commit your message to writing, and in the case of new referrals, state unambiguously “If we do not hear from you within __ days, we will assume you have secured other counsel, we will close your file, and do nothing further.” This can help to avoid a future claim of reliance upon an attorney-client relationship where none actually existed. In this phase, awareness is beginning to sink in and clients begin to feel and think more deeply about the presenting problem. At this stage, both action and inaction are fairly balanced, but clients remain unready to take arms against a sea of troubles; ay, there’s the rub. When confronted with this Hamletesque ambivalence, focus your communication on addressing the consequence of inaction, such as not responding to a subpoena. Use clear, direct language such as “If you don’t ___, then ___.” When you start to see movement in the direction of action, the client’s paramount concern will be risk of failure. Be prepared, in advance, to address this concern. Know exactly what you are going to say to this question before your client asks it. Your confidence will lend your client the confidence necessary to move forward. In this phase, your client has replaced the behavior of inaction with active participation. At this stage, your client is responsive to communication, compliant with direction, and inaction can be seen as failure. This stage is perfect when there is movement in a case, but if the case has stagnated or gone fallow, you may experience repeated phone calls from your client when you have nothing new to report. If your client is in the stage of action, but the case has paused, your client may see inaction as a failure on your part. To maintain a positive relationship with your client, find substitutive activities to satisfy the need for action; give your client something to do. This may be having your client review materials already part of the case, or preemptively introducing materials for the next stage of the case. If there is absolutely nothing for your client to do, make sure you check in weekly to consistently remind your client that you are on top of the case. Adding a communication tickler to your calendar takes mere seconds and could prevent losing a client. In this phase, your client is in harmony with the status of the case. When action is necessary, your client answers the call. When the case is paused, your client understands and accepts that reality. Even though this stage is fairly smooth sailing, you will want to engage in periodic communication to ensure your client stays in this phase. Emphasize what a good job your client has done and how much they have helped you. Recognizing positive behavior encourages this behavior in the future and nurtures the relationship. Appalenia Udell is the Health Lawyer for Doctors serving physicians in California, Colorado, and Washington. Appalenia worked in medical practice management and healthcare administration for over 10 years before attending law school at UC Berkeley where she received academic distinction in Health Law. Subsequently she was an associate attorney at Hooper, Lundy and Bookman in San Francisco, as well as Physicians’ Advocates in Berkeley, before moving to Colorado to open her own practice specializing in physician representation. She loves all Colorado has to offer, and enjoys living in Centennial with her husband and their new baby daughter. Appalenia can be contacted at law@appalenia.com.